My Data Keeper 2 provides you an easy way to gather, organize and protect all the important information for you! 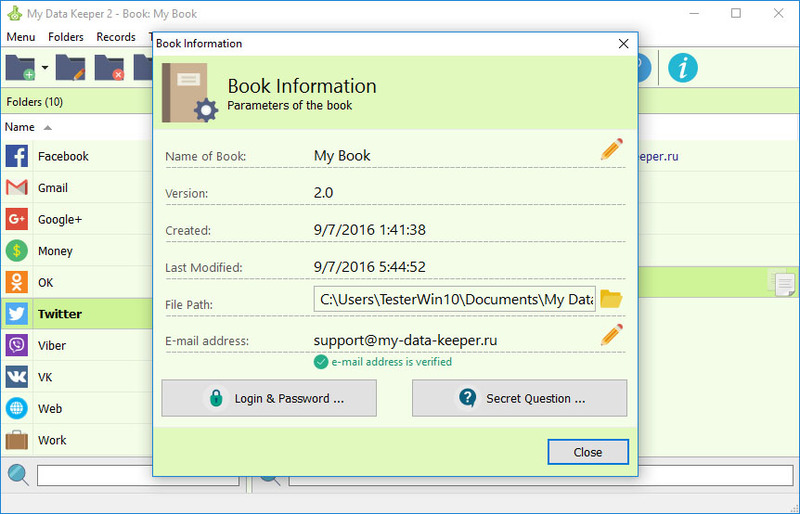 My Data Keeper 2 is a program created to protect your passwords and personal data. 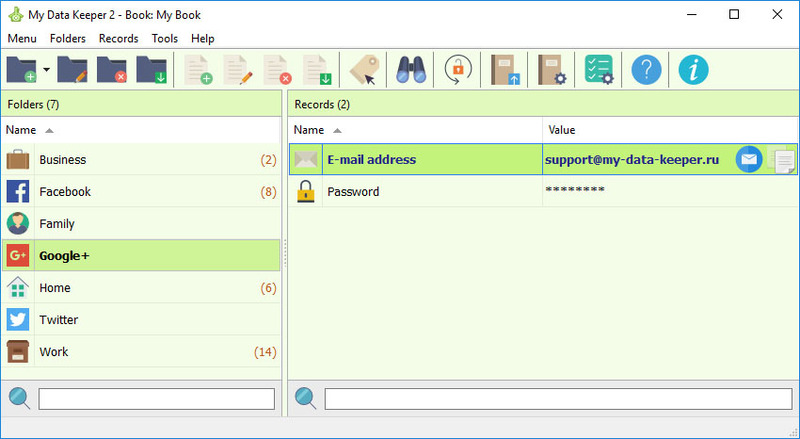 My Data Keeper 2 – a convenient and easy-to-work password manager and keeper. Your passwords will be stored in one database, which will be securely encrypted and protected by the password set personally by you. Storage of passwords in address books or in text files isn't safe long ago. In order that your passwords, logins and other valuable information remained are protected always, use the My Data Keeper 2 program. Application is suggests protect your data by encoding. Convenient and easy in mastering, the program will become the irreplaceable assistant. You will be able to create several account-books. For example, the book for work: logins, passwords, references to the websites which you use in work will be stored. You can create the book for travelings and rest where stored numbers of credit cards, bank accounts, links to hotels and data of a private office. There is a lot of options. Moreover, you will be able always to use your data if you store books in a cloud storages. Undoubted advantage of the program is the insertion of values in one click by means of the "Bind Value" function, and having used the hot keys you will be able to accelerate operation. In addition to program security, My Data Keeper 2 the master password who you invent protects each book, thus, nobody will be able to use your data without knowing the master password. Thanks to the built-in generator of passwords, you will be able to create passwords, difficult for cracking. 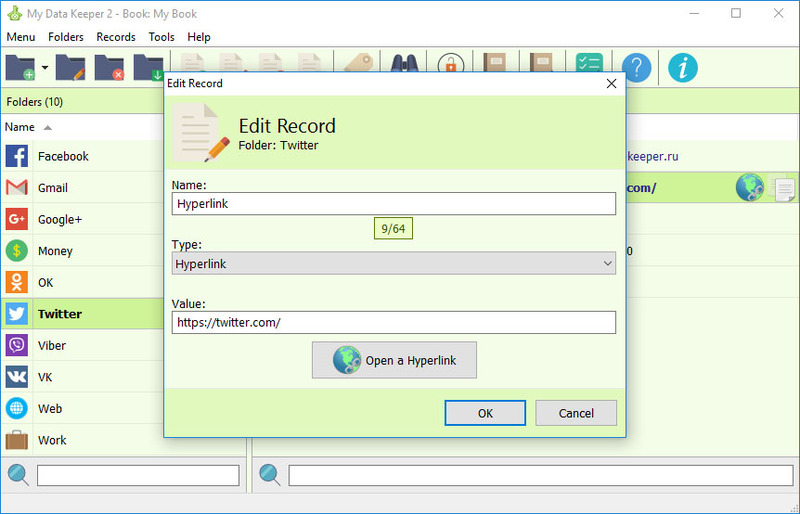 You will be able to systematize all data in My Data Keeper 2 by means of nested subfolders in folders. For each folder and the subfolder you can set the appropriate icon for convenient perception. And by means of search, you will be able always to find the necessary record. 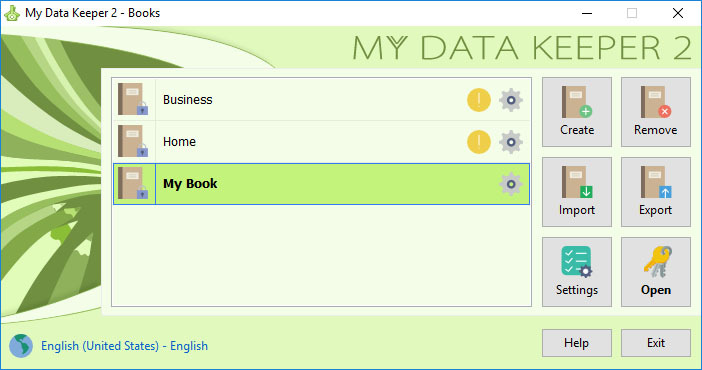 My Data Keeper 2 is a number of opportunities for convenient storage of your data. My Data Keeper 10/10! If you value security, My Data Keeper is what you need exactly!..